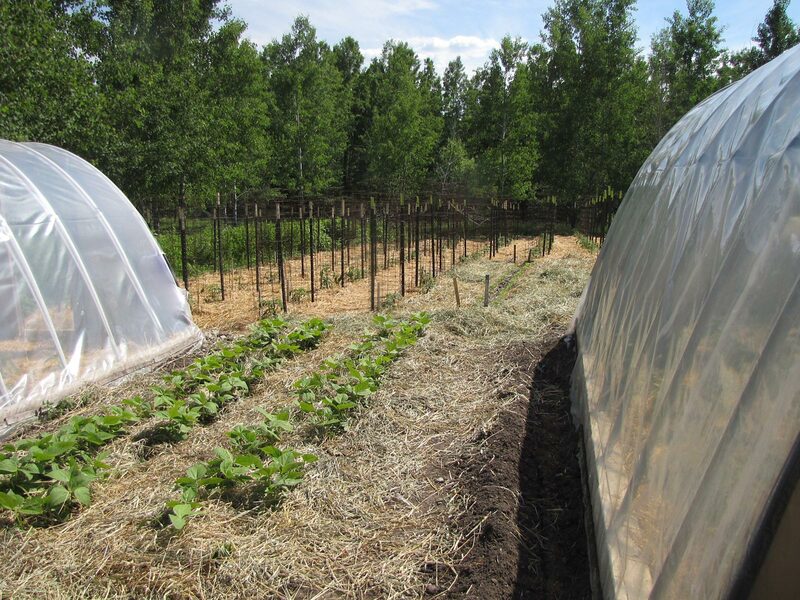 Here’s a glimpse at the two double rows of Provider green beans after being mulched. I got stupidly greedy and planted two LONG rows in the Central garden. What was I thinking? We’ll be buried in green beans in two months’ time. Will is nearly finished hand weeding between the plants and mulching our main garden. I’ve been planting the dahlias and cannas I started indoors a few weeks ago. I planted a row in front of the porch and a nice bed down in front of the first hoop house. By the way, if you’ve ever struggled with growing cannas, I heartily recommend the roots Glenn and Linda Downs of Sand Hill Preservation Center offer. Boy, I’ve never seen such roots since Grandma’s! And they’re growing so nicely now too. 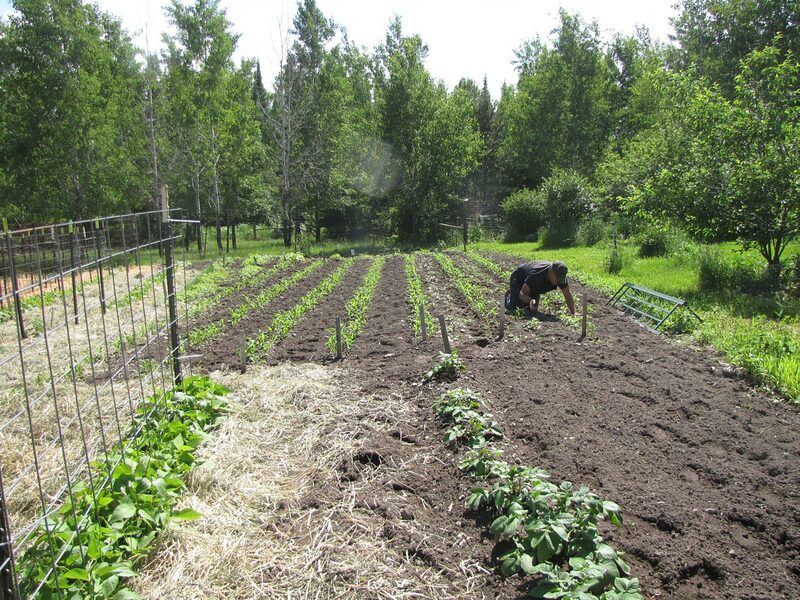 Will is busy weeding the Seneca Sunrise sweet corn which will soon be mulched. Our trusty cat Mittens, and dog Hondo help Will out by keeping him from getting lonely while he weeds. And they are also on the watch, protecting him from vicious voles, grizzly bears, and tigers while he works. 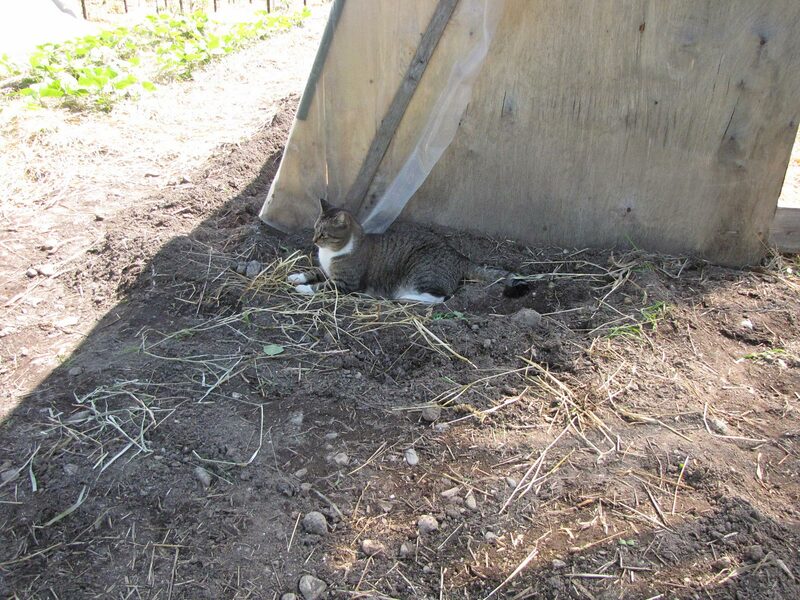 Mittens keeps watch for voles while Will weeds nearby. Very few escape her eagle eyes! I’s a weird year here. Still don’t have potatoes emerging. Last Friday our soil temperature was only 50. We have had showers but 60 miles south of us it has rained so heavy that two different bridges were in danger yesterday. At least the green house is doing good. Your gardens look great. Wow, lettuce AND tomatoes! Will “woopsed” and tilled my first row of lettuce up. EEEEK. But there still are a few plants coming up so it wasn’t a total loss. And our tomatoes are quite a ways from eating; about 18″ high but lusty. Tell your husband to eat lots of that good food. I love your green beans, if only I could have to many! Ha . Green beans are my hardest thing to grow. After third planting I finally have some bush ones up and going. Forget the pole beans so difficult. Your Seneca corn is doing great, thank you, can’t wait. Ah, Jackie, but it feels so satisfying to look at all those jars of home canning. I feel so much more secure when I know I won’t have to worry for food if money gets tight or times get tough. My challenge is eating up the canned food. It all looks so pretty in the jars that I don’t want to open them and eat —- just want to admire my handiwork. Don’t those jars look like jewels on the shelves??? Ah, homesteading! Have bluerbirds nest every spring here in East Texas then they leave I guess for cooler country BUT this year they have had 2 sets of kids and are still here in our heat. By the way our garden is down to peas and lima beans, everything else is finished and canned or given away. Will plant fall garden in late August, turnups, mustard, collards, etc. Send us some rain we are getting close to a burn ban it is so dry. Believe me, I sure would, if I could. Before this last deluge of rain, we were really, really dry, too. David’s a volunteer firefighter and his last fires included wildfires. How do you know when to quit picking asparagus? My 7 yr old plants don’t put much out, but could it be because I quit picking too early? A good way to break the law by having tooooo much asparagus! Lol! Our raised beds have given us lettuce,tomatoes, and last night we had grilled yellow (crookneck, as Momma called it) squash and it was oh so yummy! Hubby can’t do a lot with 4th stage lung cancer,but he feels so good about the produce he grows for us to reduce the food ill and give us some variety!